It’s hard to believe that fifty-six pages of 700 year old travel details could consistently engross two seven and nine year old girls. Hard to believe, but, in the case of this beautifully illustrated and mesmerizing window to the world, nothing but the truth. 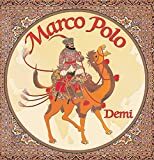 You can read more about the veracity debate over Marco Polo’s incredulous journey here. HOTLINE VOICES: A listener tells us about a book loved by both herself and son, the rhythmic and rhyming Bear Wants More (by Karma Wilson and Jane Chapman). Thanks to our daughter Lucy (9) for contributing the title of this post. Issues of body image impact lives young and old but too rarely make it to picture books where the sparked conversation might do most good. This entertaining yet thoughtful look at hairlessness is a welcome exception. 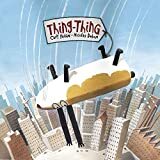 Whirrrs, roars, thuds, clunks and dings are exposed as the expected soundtrack of a safe and exciting flight in this warm and reassuring, rhyming adventure. This episode is dedicated to our friends and fellow children’s literature authors, illustrators and enthusiasts all over North America who at this very moment are boarding planes, trains and automobiles en route to the Second Annual KidLit Conference in Portland, Oregon. Have a FABULOUS time! Pop over to The Miss Rumphius Effect for today’s full menu of poetry offerings. Poetry Fridays are brought to us by Kelly Herold of Big A, Little A.
HOTLINE VOICES: Kristen Chase of Motherhood Uncensored and Cool Mom Picks in Atlanta, Georgia shares her thoughts on a Canadian Classic: The Paper Bag Princess (by Robert Munsch and Michael Martchenko). Thanks, Kristen! Toasty tones, a hint of terror and boisterous, confident rhyme make this gleeful triumph over imagined dangers a rowdy and reassuring bedtime read. Author/Illustrator extraordinaire, Mo Willems, shares his thoughts on Dinosaur vs. Bedtime, a new book written and illustrated by Bob Shea. Pop over to Biblio File for today’s full menu of poetry offerings. Poetry Fridays are brought to us by Kelly Herold of Big A, Little A.
Dizzying perspectives, deadpan musings and the small scale dramas of everyday life turn a slo-mo tumble from a sixth storey window into an entertaining peek at excess, ingratitude and the thrill of being loved. Based on a true story and starring a Newfoundland dog, this suspenseful account of a daring maritime rescue is an inspiring reminder of the resourcefulness, generosity and pluck of an era gone by. You can read more about the Canadian Coast Guard vessel, CGCS Ann Harvey, which was named for one of the young rescuers, here. You can learn more about Newfoundland Dogs here. Breezy, evocative images and fondly recalled, first-person narrative provide an intimate — if imagined — look at the early life and loves of Jazz legend, Art Tatum. You can learn more about Art Tatum here. Dreamy, maritime seascapes and homespun charm are brushed lightly with a glimmer of the extraordinary in this magical story of sibling belittling and the delight of possibilities. What takes more courage than agreeing to spend an entire day with your number one enemy? Not much. This peppy parable proposes a plucky new approach to sticky social situations.